Soil your T-shirt in the name of glory—and $1,500. Pass the wet naps. You can never have too much of a good thing—unless that thing is wrapped in bacon and you’ve already eaten half your weight in it. 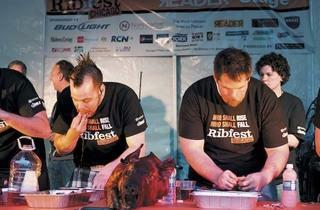 Luckily for us amateurs, Ribfest Chicago’s (Jun 7-9, 2013) RibMania leaves competitive eating to the professionals. 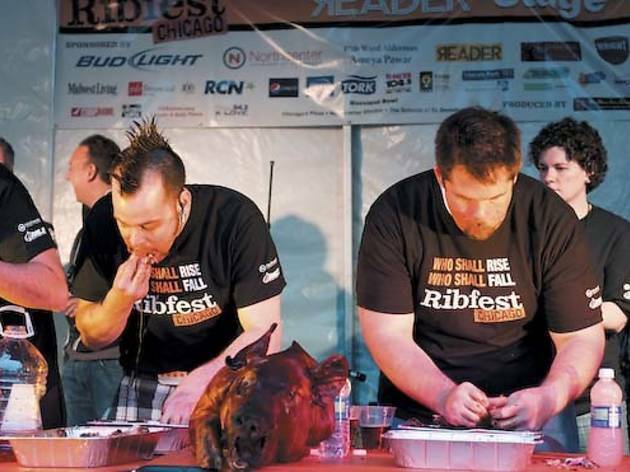 “We’ve had three of the top ten nationally ranked eaters on our stage each year, and this year we are hoping for more,” Ribfest spokeswoman Melissa Lagowski says. RibMania, June 8 at 6pm, is the only International Federation of Competitive Eating (IFOCE) sanctioned rib-eating contest in the Midwest, and this year, Tim “Gravy” Brown and defending champion Patrick “Deep Dish” Bertoletti—both ranked in the top ten by the IFOCE—will compete to see who can eat the most ribs in eight minutes. Think you can chow down with the best of them? Join the amateur rib-eating contest; the winner is automatically entered in RibMania for a chance at the $1,500 grand prize—that is, if he or she’s still up for the challenge. Five minutes is all you’ve got to shovel as many mashed potatoes into your mouth as possible during the Irish American Heritage Festival’s (Jul 12–14, 2013) Mashed Potato Eating Contest. Need to reward yourself after working up a sweat in Long Grove Apple Festival’s (Sept 27–29, 2013) pie-eating contest? Come back on Sunday and top it all off with an ice-cream-eating contest. Both food frenzies take place at 2:30pm. You just can’t call it a Pierogi Fest (Jul 26–28) without a contest to see how many of those potato dumplings you can ingest in three minutes.